Set in the vast expanse of the South African Great Karoo, this beautiful homestead/lodge dates back to 1850. Built slowly and soundly to the exacting standards and architectural style of the time, the building remains unchanged with characteristic high ceilings, original wooden floors and wide verandahs which offer guests a sweeping panoramic view of the Karoo landscape. The self same atmosphere can still be felt throughout the old building even though modern comforts like ceiling fans, wall heaters, air-conditioners and en-suite bathrooms have been added to ensure our guests a comfortable stay. All accommodation leads out onto wide verandahs. 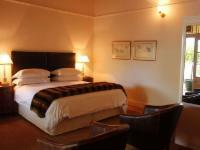 Comfortable en-suite bedrooms have tea & coffee making facilities, toiletries and hairdryers. Enjoy pre-dinner drinks around the honesty bar in the lounge, which has a cosy fireplace for the chilly winter nights. Apart from the excellent lodging facilities Lemoenfontein offers real South African home cooking, an honesty bar, TV-lounge with DSTV, swimming pool and braai (barbecue) facilities.Game drives early in the morning and late afternoon are an absolute must where up to 23 various game-species may be viewed, including Giraffe, Eland, Kudu and Zebra. Abundant bird life and walks for the energetic. Light Lunches are served on request for guests staying over. Please advise us of any specific dietary requirements. Mouthwatering Karoo dinners are served either on the Verandah in the summer or in the dining room, with a cosy log fire, in the winter. Small conferences, Special Occasions and Weddings are also catered for. Standard Double Room Sleeps 2 Includes: Room Only Rooms / Units: 10 Luxurious double room with king or twin beds with en-suite bathroom (some with shower only). Beautiful room and bathroom. Great surroundings. Tasty food. This was our second time at Lemoenfontein, and definitely not our last!We enjoyed our stay. Beautiful clean rooms, friendly staff, excellent service, lovely dinner and breakfast. What more can one ask for. Thank you! Lemonsfontein is located on the edge of the Karoo park and close to the smart town of Beaufort West. It offers perfect relaxation and stunning views of the Karoo. Loved it. Stayed over for one night. The staff were very friendly, dinner devine and the bed soft and cosy. The place is beautiful with a lot of character and I highly recommend a stay over to anyone passing by. Lemoenfontein Game Lodge is 8.6km from the centre of Beaufort West , the nearest airport 192.4km (George Airport).